Maritn Lee Truex Jr. was born June 29, 1980 in Trenton and grew up Mayetta, a section of Stafford Township. His father owned a seafood supplier in Ocean County and raced on dirt tracks in the region. Martin grew up watching his father’s hard work and attention to detail pay off in business and on the short tracks. By the time he got behind the wheel of his first go-kart as a teenager, racing was second nature. His younger brother, Ryan, came up the same way, too. As soon as he turned 18, Martin moved into the Modified division and began racing at Wall Stadium. Two seasons later, in 2000, he was competing in NASCAR’s Eastern series, at the time sponsored by Camping World. He drove the family’s #56 SeaWitch Chevy to 13 poles and 5 checkered flags. Martin also got a taste of Busch series racing with a handful of starts in 2001 and 2002. He began racing full time on the Busch circuit in 2003 and won the championship in 2004 and again in 2005. During the 2004 season, Martin got his first ride in the NASCAR top-flight Nextel Cup series. He entered the Bass Pro Shops MBNA 500 in Atlanta driving for Dale Earnhardt Enterprises, and finished 37th. Martin began racing full-time for DEI in 2006. He finished 19th in the standings. In 2007, he won his first major event, the Nextel All-Star Challenge. Martin improved his year-end standing to 11th. He made headlines again in 2009, when he won the pole at the Daytona 500. 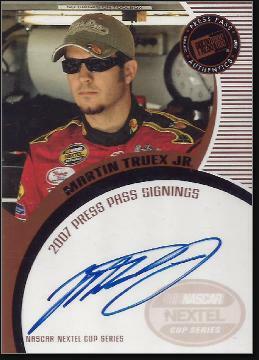 In 2010, Martin signed with Michael Waltrip racing. He had a shot to win the Daytona 500 that summer on the final lap, but fell short. Martin seemed poise to join the elite names in racing, but over his four years with the new team he had fewer ups than downs, finishing out of the Top 10 year-end standings every time. In 2014, Martin signed with Furniture Row Racing in Denver, the only NASCAR team based west of the Mississippi. He turned in his finest year in 2015 when he notched 14 Top 10 finishes in his first 15 races. The last driver to accomplish this feat was Richard Petty, in 1969. Martin led many of these races for long stretches, only to fall back after poor restarts or late pit stops. Finally, in the Axalta 400 at Pocono Raceway, he took the checkered flag for just the third time in his Sprint Cup career. Martin qualified easily for the Chase for the Sprint Cup and made he final four. He finished the year 4th overall. Martin began 2016 by turning in a dominant performance at the Daytona 500. He lost to Denny Hamlin by 1/100th of a second—the closest finish in race history. He followed later that season with a victory at the Coca-Cola 600 in Charlotte after leading the race for 588 miles—the most for any race in NASCAR history. He won two more races in 2016 to finish 11th. Martin’s giant leap forward would have to wait until 2017. The season was marked by a new three-stage format. Championship points are awarded to the top finishers in each stage, with the race winner being the driver who takes the checkered flag. At the third race of 2017, the Kobalt 400, Martin became the first driver to win all three stages of a race. He won again in May at the Go Bowling 400 at the Kansas Motor Speedway. The following month, Martin won his 10th stage at a point where no other driver had won more than four. In July he captured all three stages again in winning the Quaker State 400. He won his fourth race in August at Watkins Glen. He clinched the regular-season title at the Southern 500. NASCAR’s “playoffs” began in mid-September at the Chicagoland Speedway. Martin won the race to carve out an early lead in the Chase for the Cup. He won again at Charlotte and then two weeks later at Kansas (his fourth in a row at the track). He finished second, second, third and first in the final four races—the victory came at Homestead—to sew up the Monster Energy NASCAR Cup Series championship. In winning 20 of 108 stages, Martin logged one of the most consistently fine seasons in recent history.